As a child, my favourite part of a meal was dessert. If I went to a restaurant I would sometimes not finish my main meal and claim I was full up! Hence leaving room in my second stomach for dessert. My dessert stomach. Which was never full and always wanted more! It was always something with a grand name, multicoloured and served in a frosted sundae glass. Ice-cream, strawberry syrup, chocolate sauce, cream and topped with sprinkled nuts. 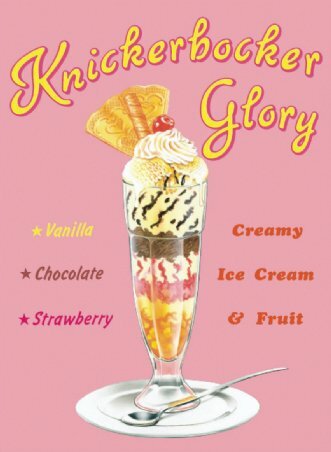 My favourite, the Knickerbocker Glory. As you grow-up your taste changes and I find that nowadays I don’t necessarily have to end a meal with a dessert/pudding. Not that any of this means that I forgo all desserts! On the contrary, I still have a sweet tooth, it is just that now a liqueur almost seems more appropriate. On the occasion that I do order dessert, I tend to order things like Banoffee Pie with its thick wodge of biscuit as its base and luscious, cool, caramel topping. But unless it’s a special occasion I really don’t want to have to create this at home. Boiling tins of condensed milk for hours on end, waiting for them to cool before being able to pour them over the biscuit base and banana layer. Then chilling this before you can put on the cream layer. By the time I would sit down to eat dessert I don’t think I’d want to. What an ordeal. Speaking from experience, none of the stages are particularly difficult but home cooking should not be about spending 3hours+ preparing a dessert. A regular dessert in my repertoire is a plum crumble. Generally, supermarkets sell out-of-season fruit which tends to be under ripe and tart therefore cooking them brings out their natural sweetness. 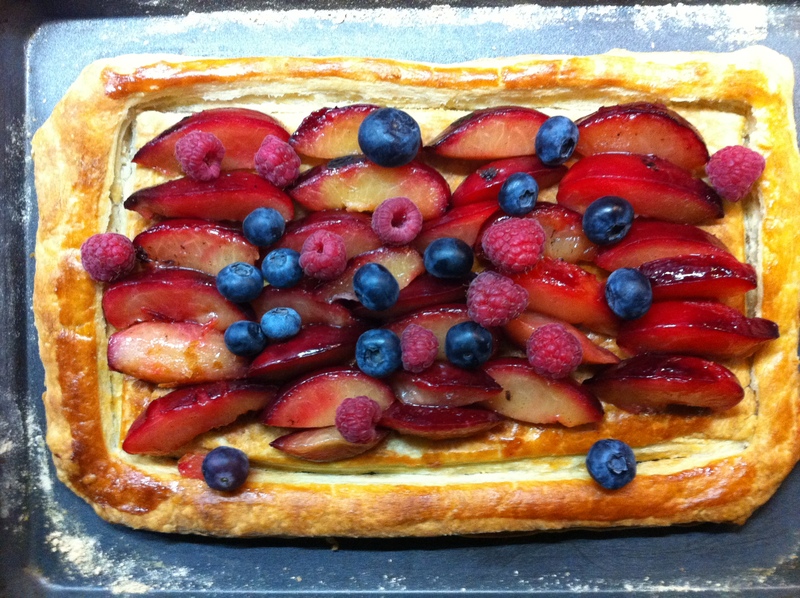 However, to try something different, instead of making a plum crumble, I made a plum, blueberry and raspberry tart. 1st: Cut the plums in half and remove the stone. Cut into segments. 2nd: Add these plum segments to a very hot sauce pan and sprinkle over some sugar. 4th: Pierce the plums to check that they have been cooked through but are not falling apart. Pour into a colander and collect the juices in a saucepan. 5th: Whilst the plums are cooking roll out some shop bought all butter puff pastry. If you’re feeling adventurous make your own but this is unnecessary. If you want to save time buy some already rolled puff pastry. 6th: Score an edge into the rolled pastry and eggwash. Pierce the centre before placing into a hot oven for 20mins. 7th: When cool enough, press the middle down leaving the edge intact. 8th: Assemble the plums, blueberries and raspberries onto the centre. or using a blow torch which is too much fun for words! 9th: Reduce the plum juices in the saucepan (step 4) until they are sticky and coat the back of a spoon. 10th: Pour these juices over and serve with clotted cream on the side. I think you should make one and bring it to school! I’d forgo la dieta to have a piece! Lol! Looks delicious!